The Calgary Flames had a rough opening week to the season with a record of 0-2-1. The Flames opener against the San Jose Sharks was going quite well through the first, it was almost like they were a completely new team under coach Bob Hartley. They dominated the first as if the Sharks were stuck in quick sand. The Sharks barely survived the first period with a score of 1-0 for the Flames, thanks to Lee Stempniak. The score could have been much worse if the Flames didn’t hit 2 posts and if Antti Niemi didn’t stand on his head. However, when the second period commenced, it was almost as if the Flames had taken sleeping pills during the intermission. The Sharks dominated the rest of the game eventually winning 4-1. The second game of the season took place again in Calgary, against the Anaheim Ducks. The Flames let the Ducks score 3 quick goals early in the first period, but they battled back by the end of the period to make the score 3-2, Curtis Glencross and Alex Tanguay recorded the goals. During the second period, the Flames managed to finally even up the score by yet another goal by Glencross. When the third period came around, the Flames sat back and let the Ducks re-establish their lead to 5-3. Stempniak managed to add one more making the score 5-4, but that was as close as the Flames would come to forcing over time. 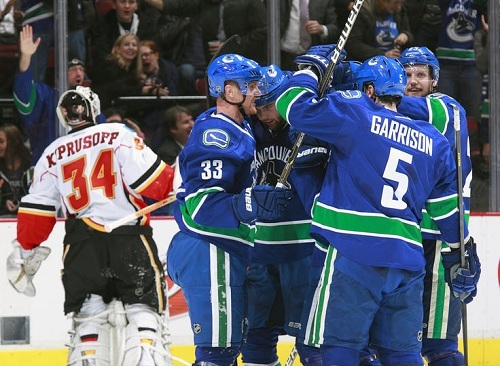 The Flames hit the road for their third game against the Vancouver Canucks. Goalies were the story for the first period, mainly Mikka Kiprusoff as he kept the Flames from getting down early once again. Although, when the second period came around Kiprusoff could no longer hold them off. The Canucks scored 2 quick goals 2 minutes apart. The Flames would battle back and even up the score by the end of the period, thanks to Tanguay and Mikael Backlund. The third period went scoreless, and so did over time. The Flames lost in the shoot out with only one person scoring, Tanguay. The Shoot out has been an ongoing problem for the Flames, but the return of Jiri Hudler should help that cause. VANCOUVER, CANADA – JANUARY 23: Henrik Sedin #33 and Jason Garrison #5 of the Vancouver Canucks congratulate goal scorer Zack Kassian #9 of the Vancouver Canucks while Miikka Kiprusoff #34 of the Calgary Flames skates away during their NHL game at Rogers Arena January 23, 2013 in Vancouver, British Columbia, Canada. Although the Flames have yet to obtain their first win, some players have played exceptionally well. Lee Stempniak (2 goals) and Curtis Glencross (2 goals, 2 assists) are doing well along with Mikael Backlund, the Flames first round pick from 2007. Many have been waiting for Backlund’s break out year and it looks like this is going to be it. He played very well in Sweden during the lockout and has come back to the NHL with a whole new level of confidence. It is night & day from his last season. Rookie Sven Baertschi has also played well regardless of not recording a point, it only seems to be a matter of time before he does. The flames next game is back home at Calgary on Saturday. The game starts at 10:00 PM ET.